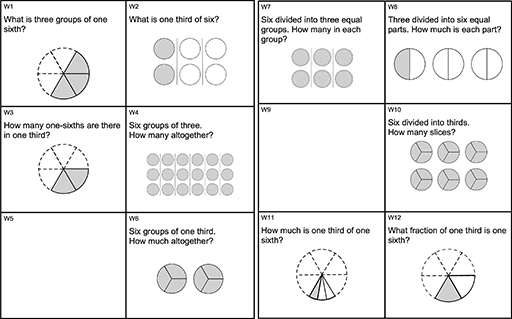 This lesson unit is designed to help students to interpret the meaning of multiplication and division. Many students have a very limited understanding of these operations and only recognise them in terms of ‘times’ and ‘share’. They find it hard to give any meaning to calculations that involve non-integers. This is one reason why they have difficulty when choosing the correct operation to perform when solving word problems. In the lesson, students work collaboratively matching cards that contain symbols, descriptions of the structure of the situations and word problems. This is done in two phases. After each phase there is a whole-class discussion reflecting on the structures being learned. In a follow-up lesson, students use their learning and your questions to review their initial answers and to complete another similar task. Each student will need copies of the assessment tasks: Multiplication and Division and Multiplication and Division (revisited), a mini-whiteboard, a pen, and an eraser. Each small group of students will need a copy of the Card Set: Calculations (cut up), Card Set: Words and Diagrams (cut up), Card Set: Pizza Problems (cut up), a large sheet of paper for making a poster, a glue stick, some felt-tipped pens, and some blank paper. 15 minutes before the lesson, a 90-minute lesson (or two 50-minute lessons), and 15 minutes in a follow-up lesson. Timings are approximate. Exact timings will depend on the needs of your class. 6.NS: Apply and extend previous understandings of multiplication and division to divide fractions by fractions.